Welcome to the new timeslot for the CASEing the Catty bloghop, we are now uploading our projects on a Sunday night. Hopefully this will mean everyone is at home and able to deal with any technical issues straight away so that we can all experience seamless transfer from one site to the next all the way around the circle! 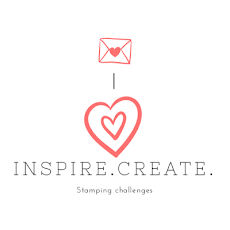 With so many amazing projects to look at on the hop lets get started. If you get lost along the way you can find all the participants here. 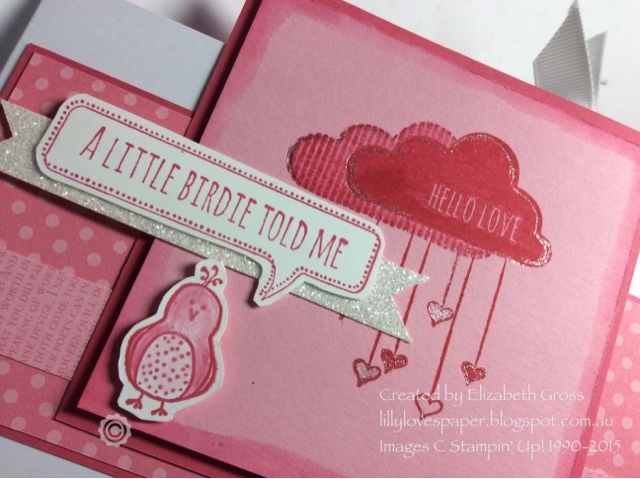 If you have arrived from Jess's blog you will have seen some azamzing projects - she's super talented. 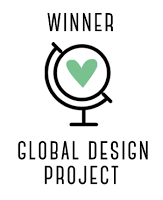 So settle down with an evening cuppa and enjoy some beautiful projects as you end your weekend. 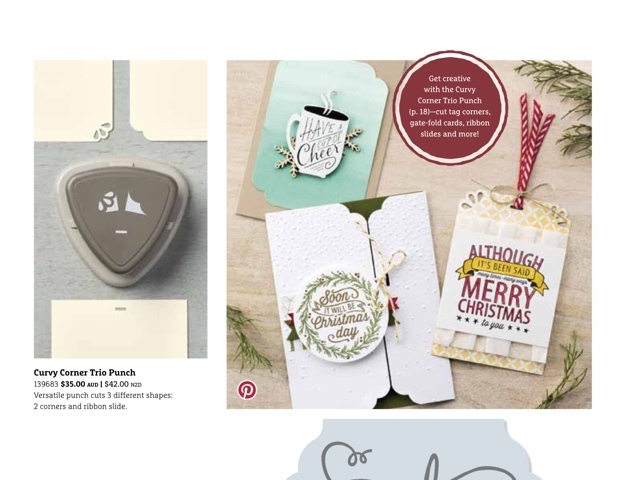 This week we are taking inspiration from pages 9-21 of the Seasonal Catalogue. There is such a lot in this section. 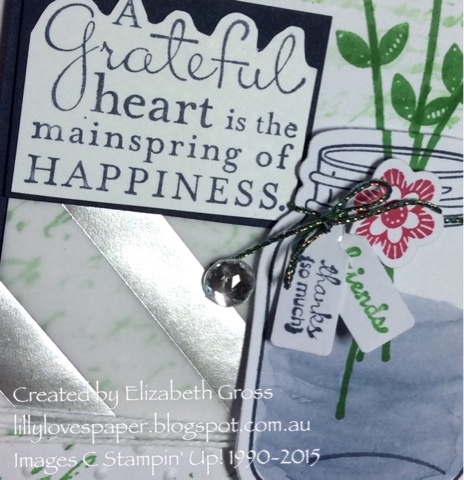 I wasn't sure where to start but my project comes from page 18, using the new Curvy Corner Trio Punch. It has taken me a little while to get used to it. The punch is divided in three sections but if you imagine a T shape in the guides it makes more sense. 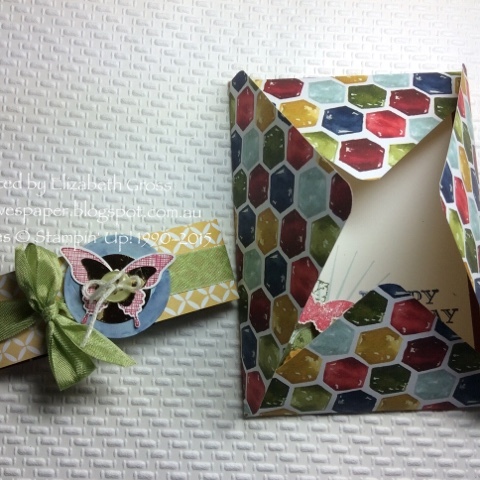 Along the top of the T is a straight edge to line up your Cardstock at any position to punch the ribbon slot. On either side of the middle of the T are the curvy corner pieces. Initially I thought you needed to place pressure only on the corner which you were trying to punch, but it works much better if you place your heel of your hand directly on the centre and push straight down quickly and cleanly. 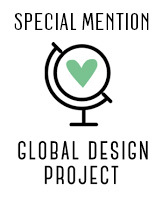 I try to put the instructions and measurements on each post for you, but also so that I can come back and find them again in the future! 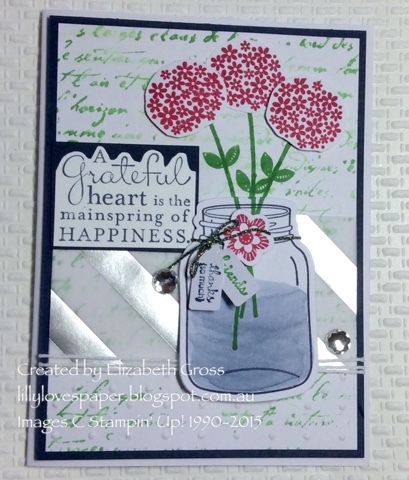 White sentiment panel 9.5 x 11 -so that is is not visible through the fancy window if you use the corner with the 3 little holes. 2 For the 2 scallop corner just be aware that it is not symmetrical so it you punch opposing corners use one edge with the paper face up and the opposing corner with paper face down. I still love the detail the tiny tags add! 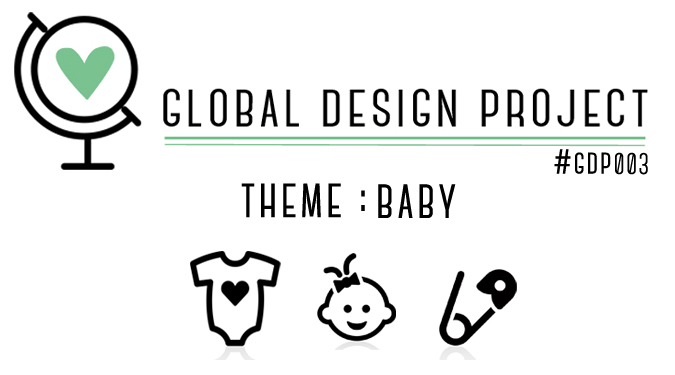 Well it's quite provident that this week's challenge at Global Design Project is BABIES! 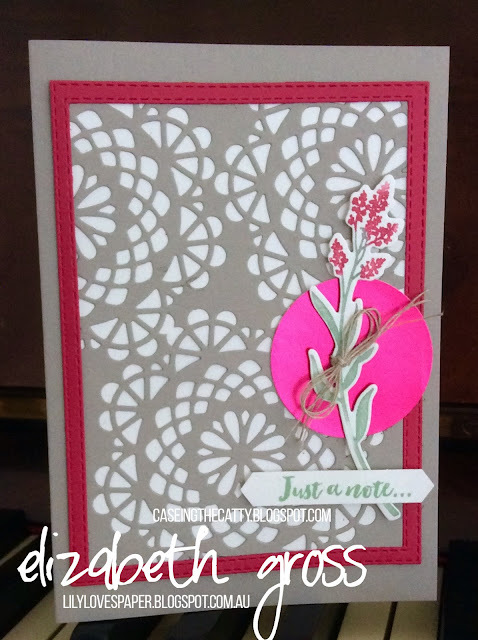 (GDP#003) as I have a special baby card for some friends who have had a long and anxious wait. 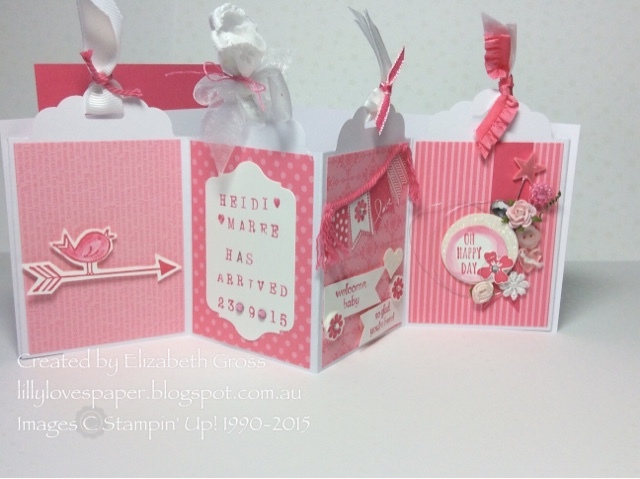 And she arrived this week safe and sound so this card is to welcome Heidi Maree. 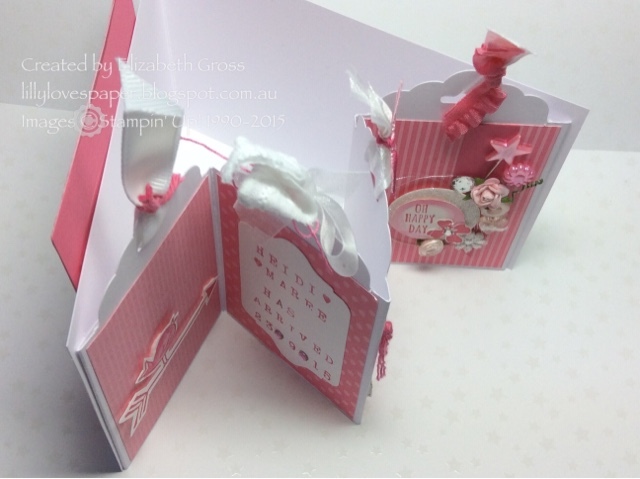 It is a folding card with a concertina of tags which I have made before for Father's Day (Accordion Tag Fold card) and you can find the instructions here. It is a little hard to photograph so this is a picture heavy post, I hope you get the idea. 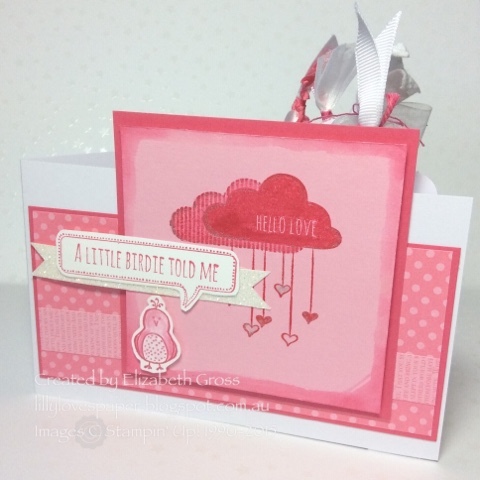 I wanted something bright and cheerful so I have used a retired colour - the bright and lovely Pretty in Pink which tones beautifully with Strawberry Slush (also retired), and I have kept it to a monotone with only a few touches of silver. 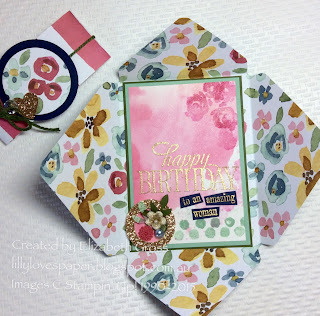 The retired set Hello Love has such sweet images, and it was a great opportunity to use the Alphabet Rotary Stamp to make this truly personal with her name and birthdate. 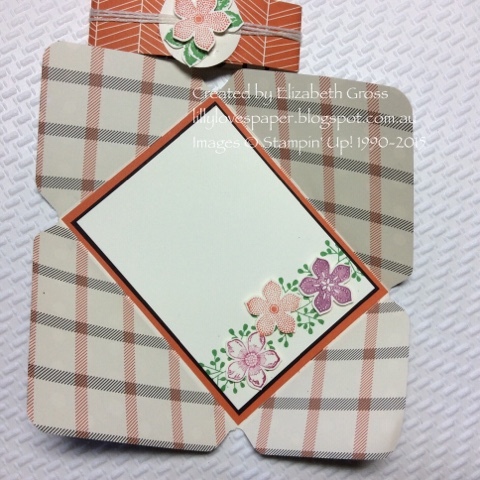 The four different tags are a great canvas to decorate in different panels, so I also used Banner Blast and Petite Pairs. 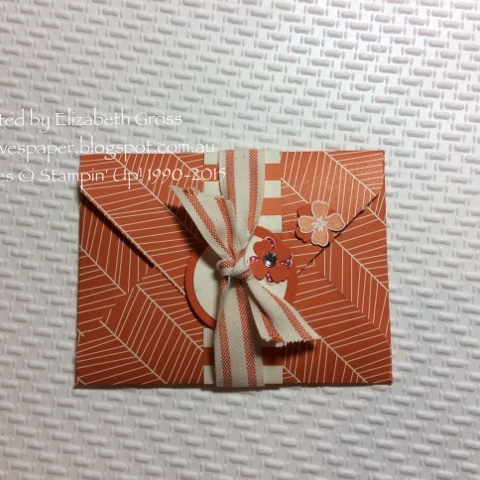 And of course I needed a custom sized envelope to accommodate the thickness and the the height of all the ribbon on the tags. 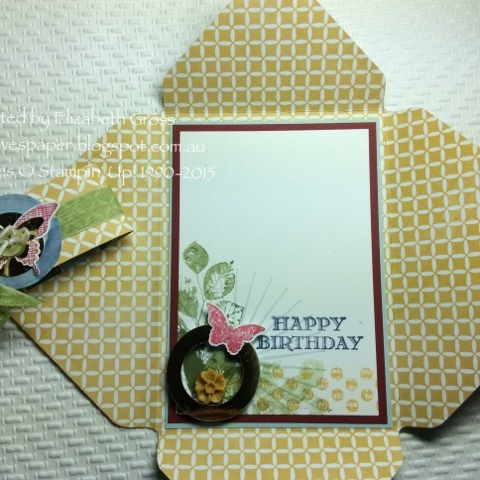 My finished size is 51/2 x 6" and was easy to create using my trusty Envelope Punch Board. 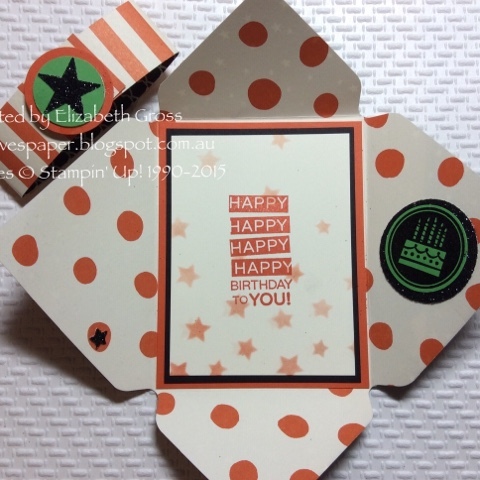 but when it's open the card will stand up by itself. Maybe you will get to try one of this style and will link back to me. If you do I'd love you to send me a photo. 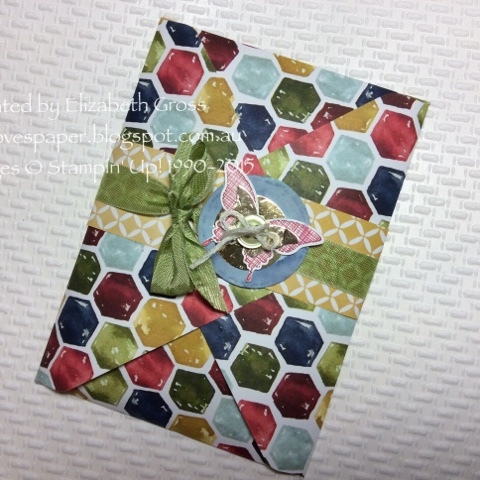 This is a card for a beautiful friend of mine and I have made it with the same design as the Envelope Notecards used for CTC#48. I have had a few request for the sizes so thought I'd make another one and note the measurements as I went! 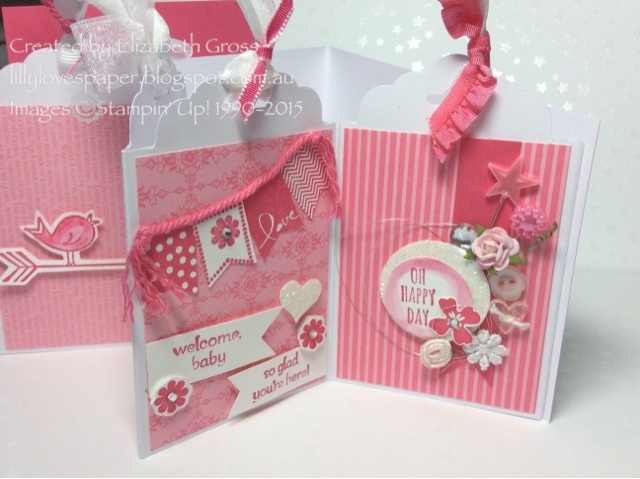 I have used the English Garden DSP with some of it's lovely colours. Mossy Meadow 51/8" x 35/8"
Mint Maccaron 5' x 31/2"
Shimmer White 43/4" x 31/4"
The Belly Band is 13/4" Wide and I just cut a12" strip and trim to a comfortable length once I have made and embellished the card inside. 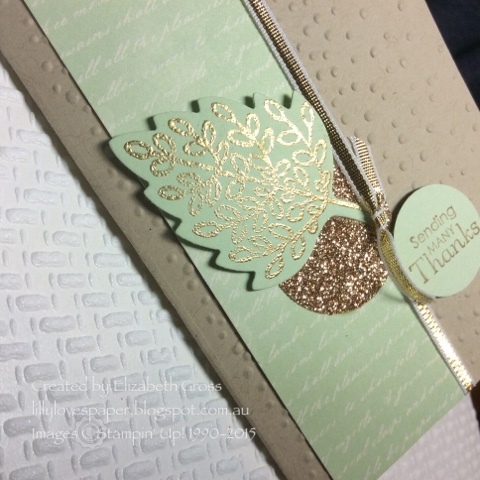 I like to be able to almost slide a finger between the card and the band so it will slide off easily. I staple the band together (smooth side of the staple facing down on the envelope, i.e. on the inside of the band- if that makes sense) then just adhere an embellishment over the join and the rough edges of the staple. Hope that make sense and that you try one!! 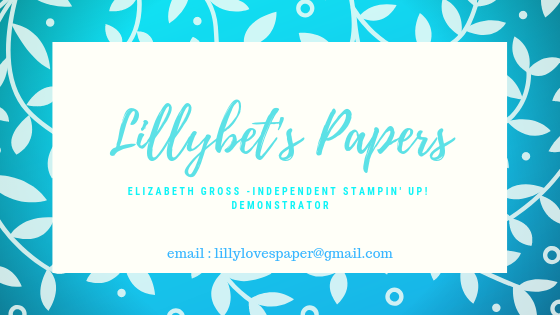 any questions please feel free to contact me. You could make these any size you like. The card is 10 1/2 " long scored at 31/2", 61/2", 7", and 10". 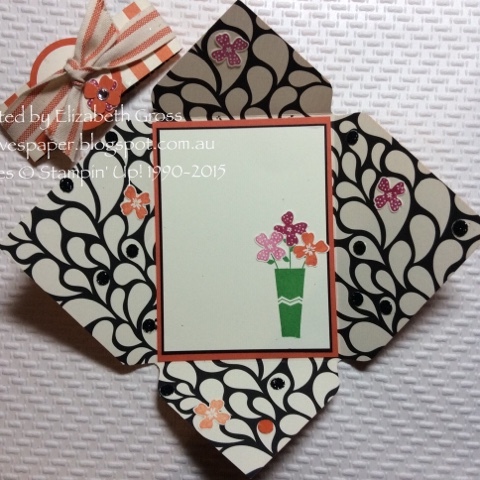 You can alter the width to suit your needs, these are cut at 43/4 to fit into the notecard envelopes. 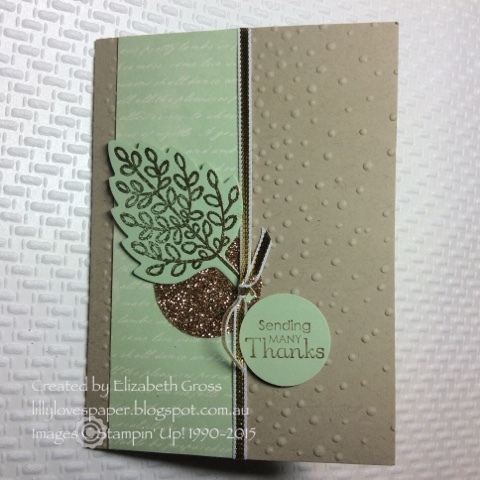 Stamps include Petite Pairs and Lighthearted Leaves, and A Whole Lot of Lovely. Welcome back to CASEing the Catty for this round. 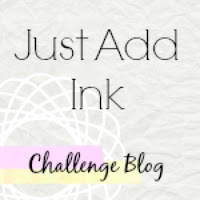 You may have come from Rachel's beautiful project or you maybe starting here. There are lots of great posts to visit. 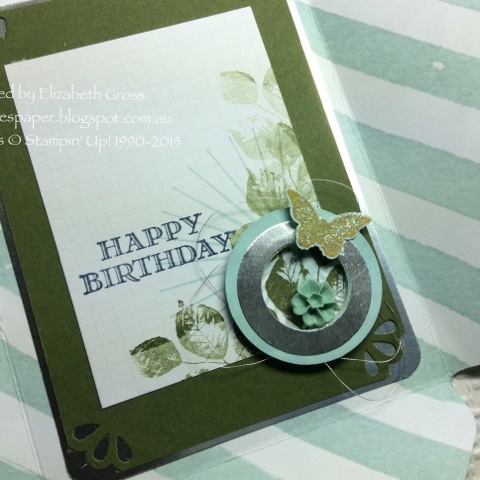 This week we are using new Designer Series paper from the Holiday Catalogue - and who doesn't love a pack of new paper? The problem of course is which one to choose.... followed by the problem of actually having to CUT into a pristine pack. ....I know you all know what I mean. 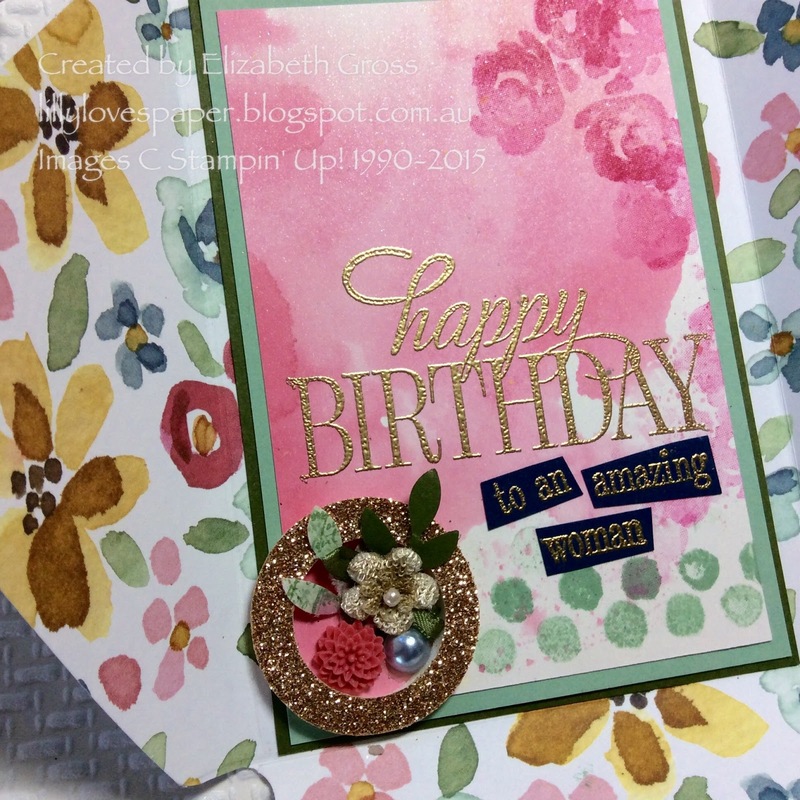 I have lots of photos for you today to try and show off some of the designs, but it's not easy to capture and they always look so much better in real life. I have purchased two packs - the Happy Haunting pack on page 47, which I was inspired to get purely from the background piece on the Lighthearted Leaves card on page 44. I don't celebrate Halloween, nor am I usually all that partial to Orange shades, but maybe that's changing! because I really like the designs. 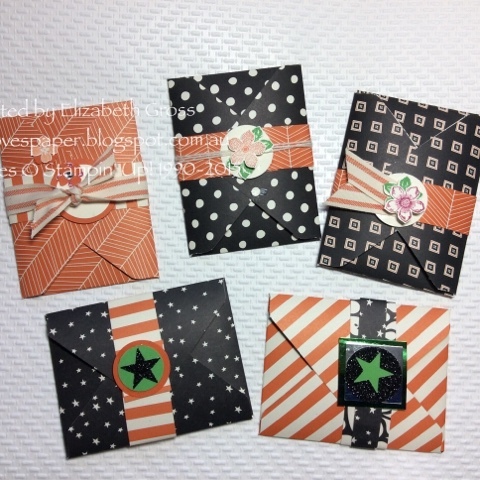 The pack has several papers that are specifically Halloween but some that are just versatile with dots, stripes, lines and stars. 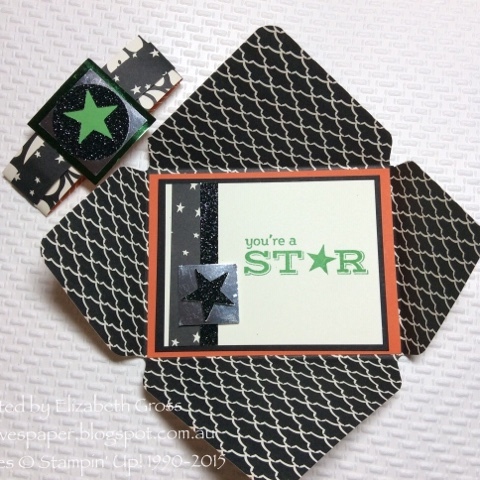 I have a class this weekend and we will be making envelope cards so I have a few samples to show you. You can see them here. 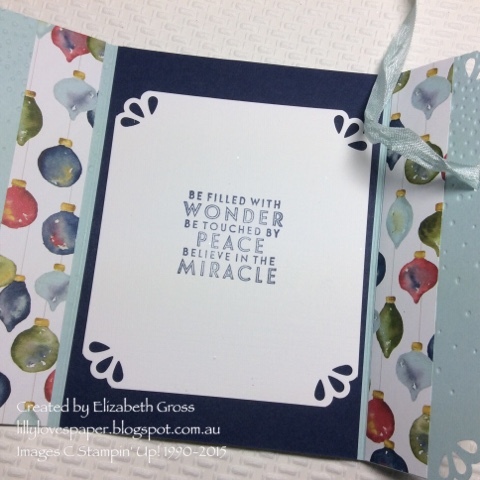 The second pack which I have purchased is the Season of Cheer pack on page 29 , and it is simply stunning. 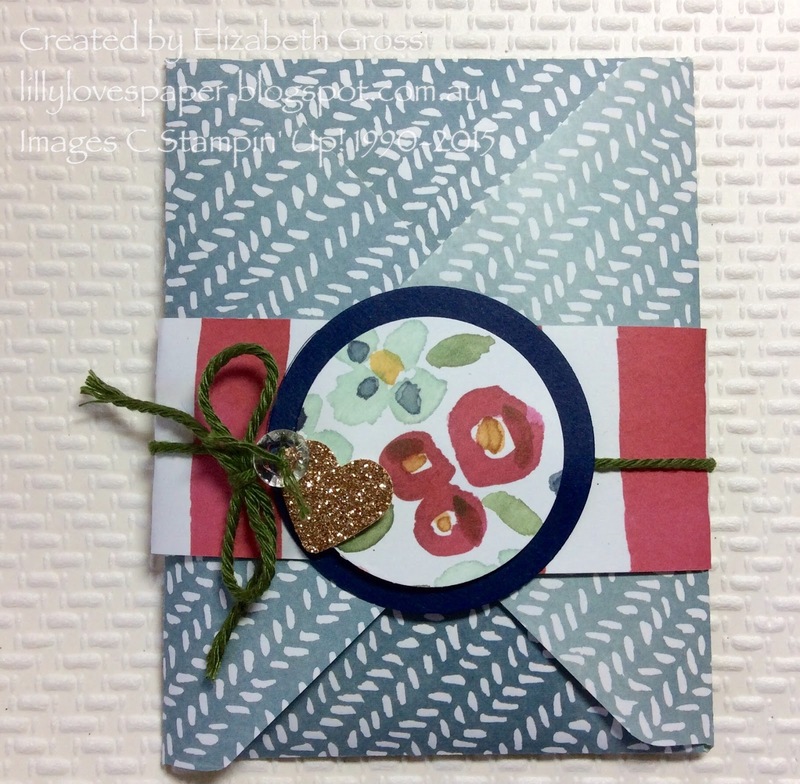 I have made some envelope notecards using my fabulous Envelope Punch Board to showcase three of the designs, because that way you get to see and enjoy both sides of the paper. 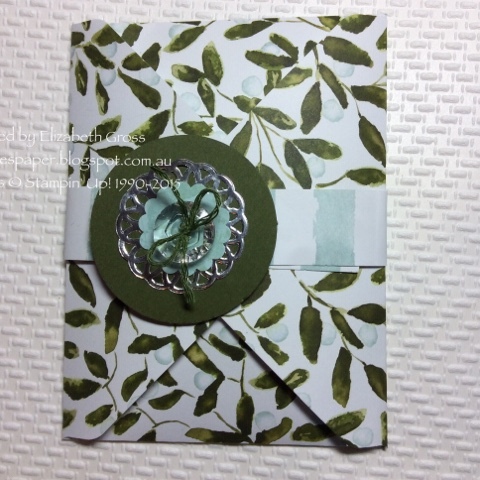 They are done in a few different designs to show you how versatile the paper pack can be and that it is not just for Christmas at all. 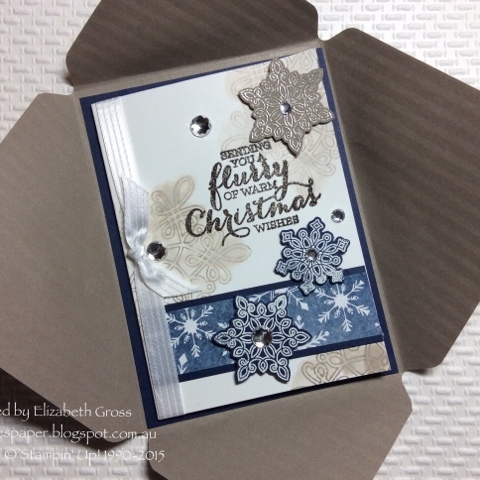 Firstly the Christmas sample, using Night of Navy and Tip Top Taupe, and the beautiful Flurry of Wishes Stampset and matching Punch. 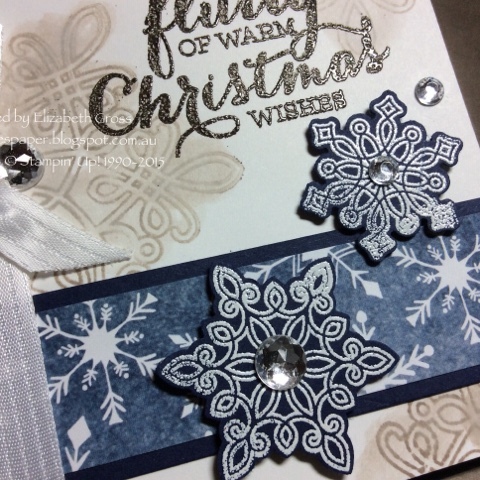 I have never really gone for snowflakes much since snow in the tropics is madness but I do like this set. 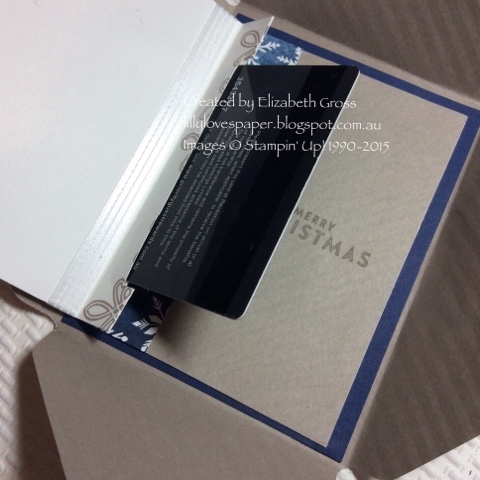 (and of course I love the magic of Christmas) The first card opens up to reveal a holder for a gift card, but the other 2 are simply flat pieces adhered to the envelope - you'll see what I mean. 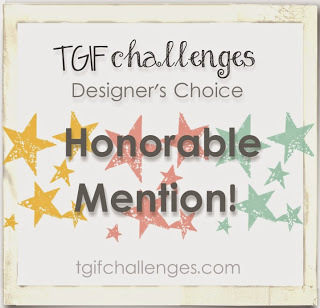 The belly bands are made using scraps and bits and pieces, and I must say I really like the Metallic Foil Doilies, which are new to me, and of course the Vintage Faceted Designer Buttons go perfectly with anything. 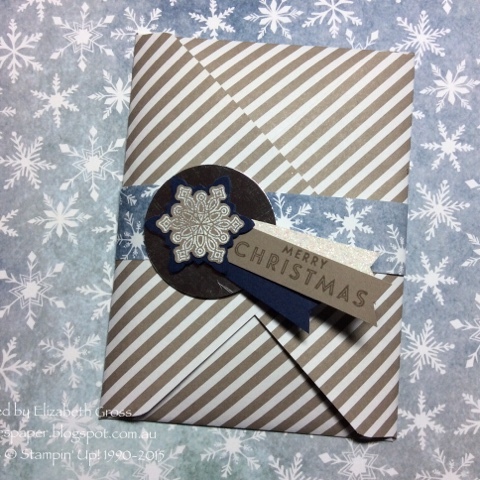 The reverse of this page has a string of lights but I wanted something more subtle, so used the Envelope Paper. This pattern piece has gorgeous bright colours and is suitable I think for many situations other than Christmas. And the final piece I will show you is gorgeous and soft colours, and suits Christmas but also other situations I think. 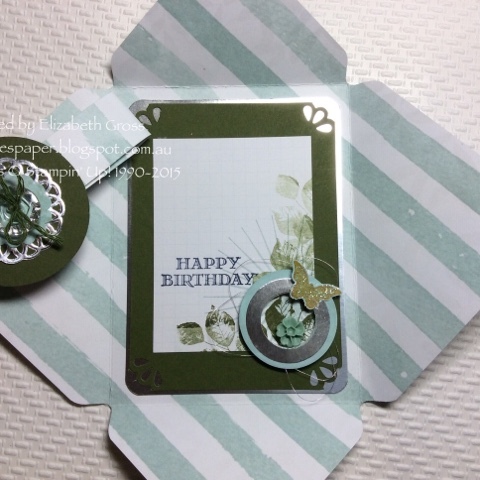 I used up some of those tiny adhesive rings for shaker frames which are too small for my fumbling fingers to manage a shaker card with - they are on the clearance rack at the moment and are great for elevating a humble ring of card. I have stocked up on a few sets, why don't you? Contact me if you need any help ordering some. Next on the hop is Stasia, I wonder what lovely things she has created this week. 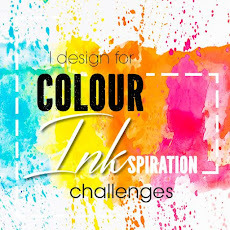 If you get lost along the way you can head back to the CTC home page to see the full list of participants, and don't forget you can join in too. I have done another post with the measurements for those who asked. You can find them here , on Sept 24. 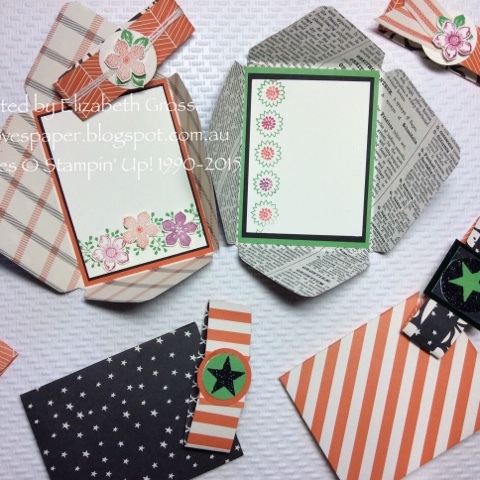 Halloween paper for All Sorts of Cards! Who says Halloween paper has to be for Halloween cards? I recently purchased the Happy Hauntings set because I was intrigued by the orange stripe pattern shown in the catalogue behind one of the cards. I am not normally partial to orange but I am challenging myself. A few of the pages are specifically "Haunting" types but most are just dots, stars, stripes and geometric patterns. Easy to use. We will be making two of these little Envelope Notecards in my class this weekend (and next Thursday). 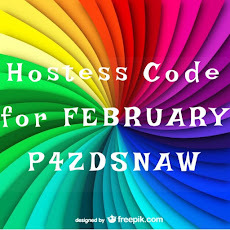 I still have a few spots if you would like to join in. Just get in touch with me. 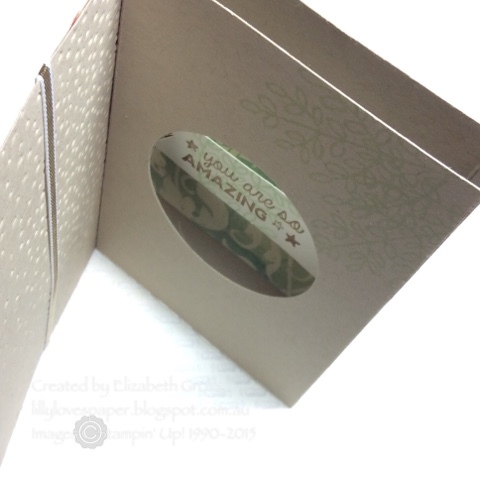 The card uses the envelope punch board and closes with a belly band. 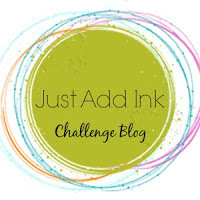 They are easy and different and you can make a few at a time. Welocme back to the bloghop. We are launched onto the Christmas Catalogue. 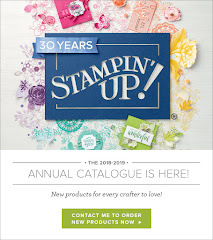 It's such an amazing Catalogue and there is so much in it to drool over! You may have arrived here from Helen's great blog. I have to admit that I don't own any of the christmas Kits. My wish list from the new catalogue was quite extensive and kits were down the list a little but I do have some beautiful products to play with and to showyou (as well as some old favourites that have been in previous Christmas Catalogues). 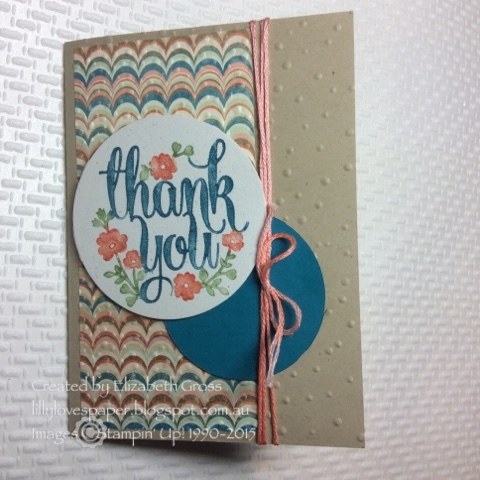 I was very taken with the bright fresh colour scheme of the To You and Yours Shaker Cards Project Kit. (p4). 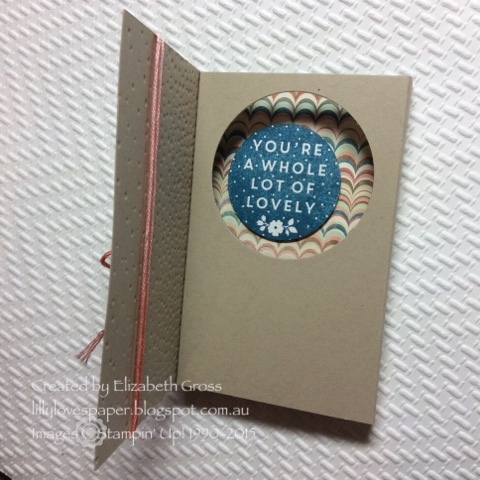 I am off to The Handmade Expo Markets tomorrow and as well as cards I sell quite a few journals. 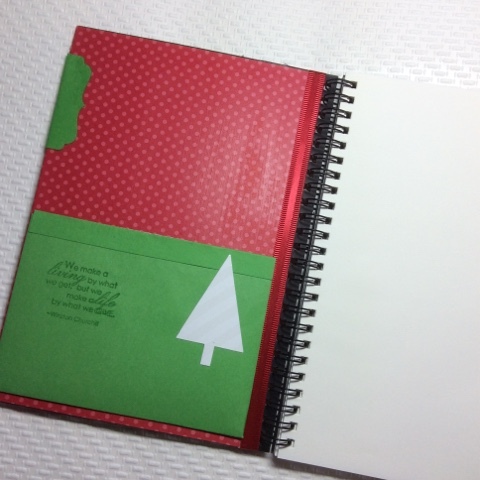 Christmas is a time of planning so what better way to start getting organised than to have a dedicated Christmas planner- and the Shaker element was just the icing on the cake, as well as a little challenge! I had to tie some red cord around the base of the shaker to hide the red rubber. 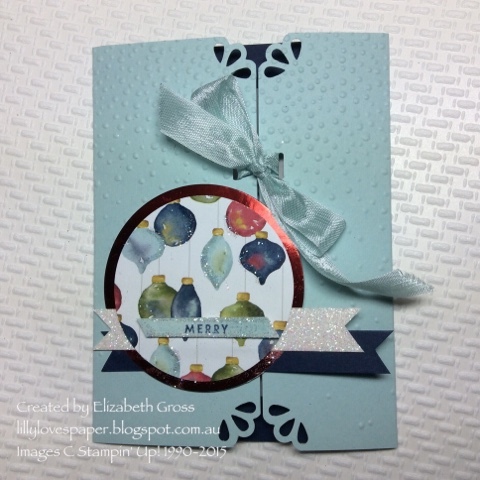 I have used some retired Real Read DSP as well as the fabulous Envelope Paper, lots of silver sequins in the shaker (as well as some silver balls and clear beads). 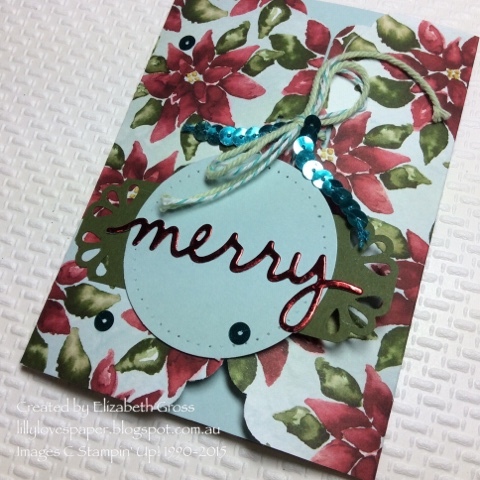 I love the new Black Glimmer Paper and used it for the numbers and some decoration strips, and I also love the new Christmas Greetings Thinlits Dies (p34). The Real Red ribbon was from last years catalogue and that is the last of it now. I might have to get me some of that pom pom trim! 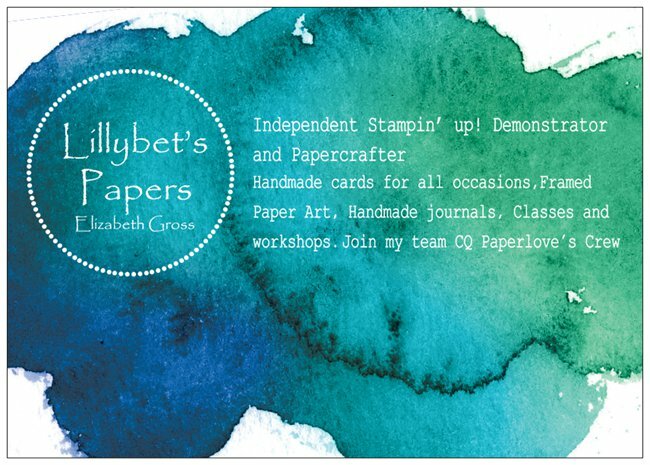 One tip I picked up somewhere- ages ago - for shaker cards or raised elements which need to be a bit sturdy is to use the leftover red rubber which comes around the stamps when you first receive them. I must admit I have saved a lot of red rubber and never used it until today! - but it does seem to be quite strong, and gives a little more height to the shaker. 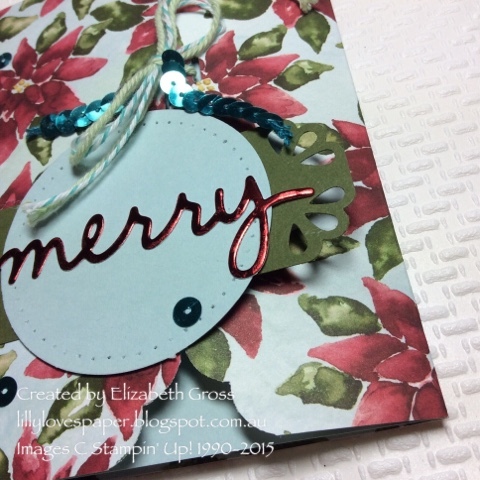 The second journal uses the Snowflakes Elements tied onto the Cherry Cobbler Cord with Silver Metallic Thread - it was the only thing fine enough to go through the tiny holes. 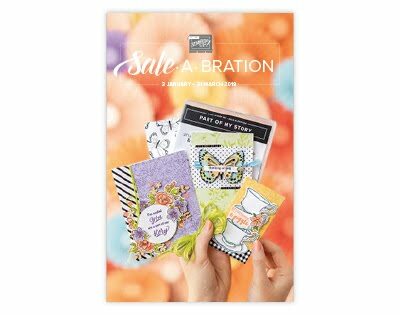 I still love the Patterned Kraft cardstock also from last years Catalogue and I have a small amount of that left too, so these projects are great to use up those pieces since there isn't enough for a class or sets of cards. 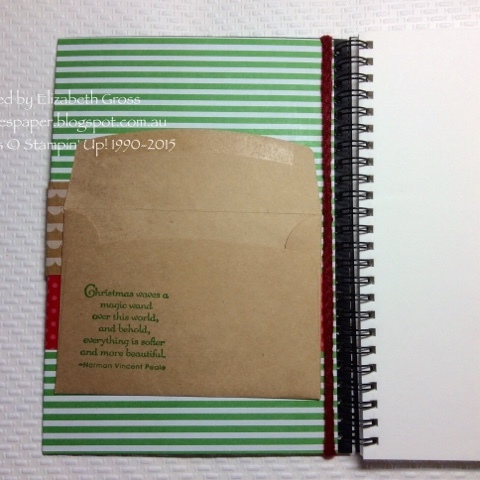 Inside each there is a pocket for receipts/ business cards/ bits and bobs. Now I have a planner I best get using it! 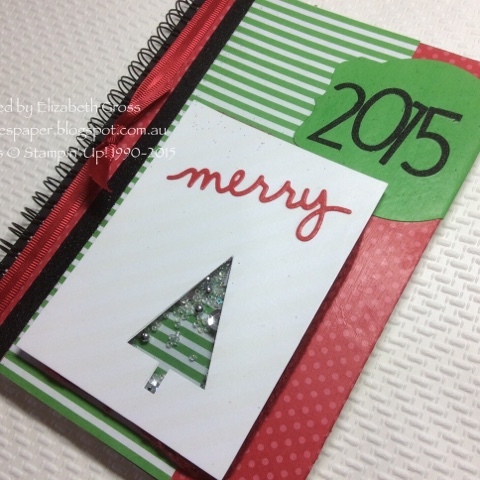 Hope your Christmas plans start coming together soon - have you made a list of Christmas Card recipients yet? First job after you finish the blogshop! 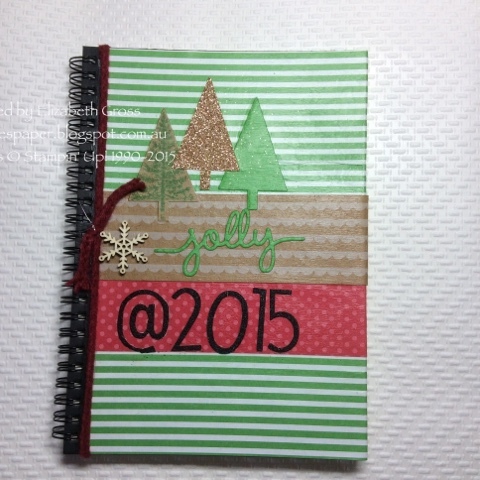 Next on the Circle is Simone and you can check out her beautiful project. 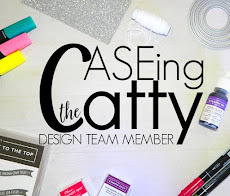 You can head back to the CASEing the Catty blog which will give you a complete overview of the participants. 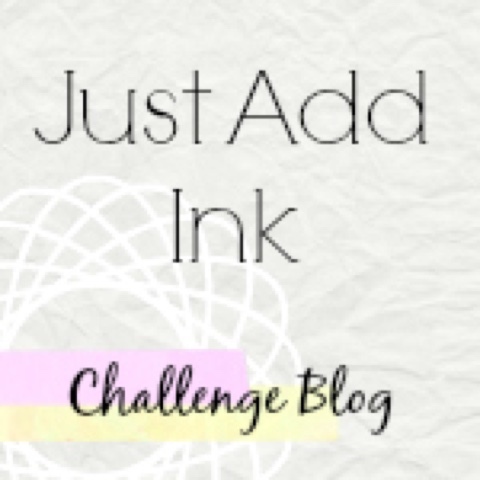 Don't forget you can also create an item inspired by the same pages and link it to the main page.